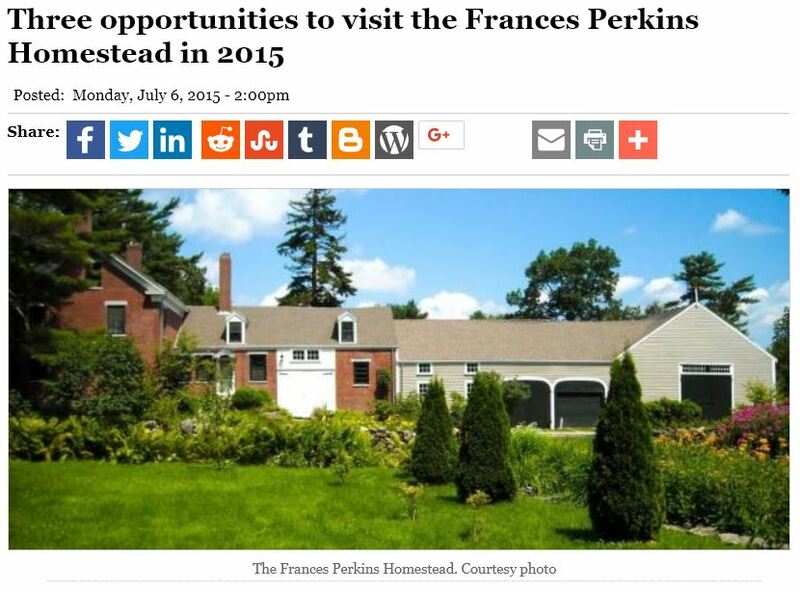 On Sundays, July 12, August 2 and September 13, the Frances Perkins Center will host guided tours of the Frances Perkins Homestead. The Frances Perkins Homestead, named a National Historic Landmark by Secretary of the Interior Sally Jewell in 2014, is the ancestral home of Frances Perkins, U.S. Secretary of Labor under Franklin Delano Roosevelt from 1933-45. Perkins was the first woman to serve in a presidential cabinet and was the principal architect behind many of the New Deal policies undertaken to combat the Great Depression and improve the lives and working conditions for generations of Americans. Among her many accomplishments in a long and productive career, she is credited with establishing Social Security, standardizing the forty-hour work week, banning child labor and developing the nation’s unemployment insurance and worker compensation systems. Tours provide a glimpse of the site’s history as a working farm, brickyard, and home to many generations of the Perkins family since the mid-eighteenth century, including Frances Perkins, its most notable member. Tours are $20 per person and begin at the OceansWide parking lot at 44 Main Street, Newcastle, ME. Two tour times are available each day. The 9 a.m. tour lasts three hours and includes the Homestead and a walk to the Damariscotta River. The 1:30 p.m. tour last 1 and 1/2 hours and includes only the Perkins home. Sturdy walking shoes and a hat are recommended. You can register online at http://francesperkinscenter.brownpapertickets.com/,by emailing info@francesperkinscenter.org or by calling the Frances Perkins Center at 207-563-3374. Bottled water and light refreshments will be provided. Tours will be led by Frances Perkins Center board members and Perkins’ grandson, Tomlin Perkins Coggeshall. 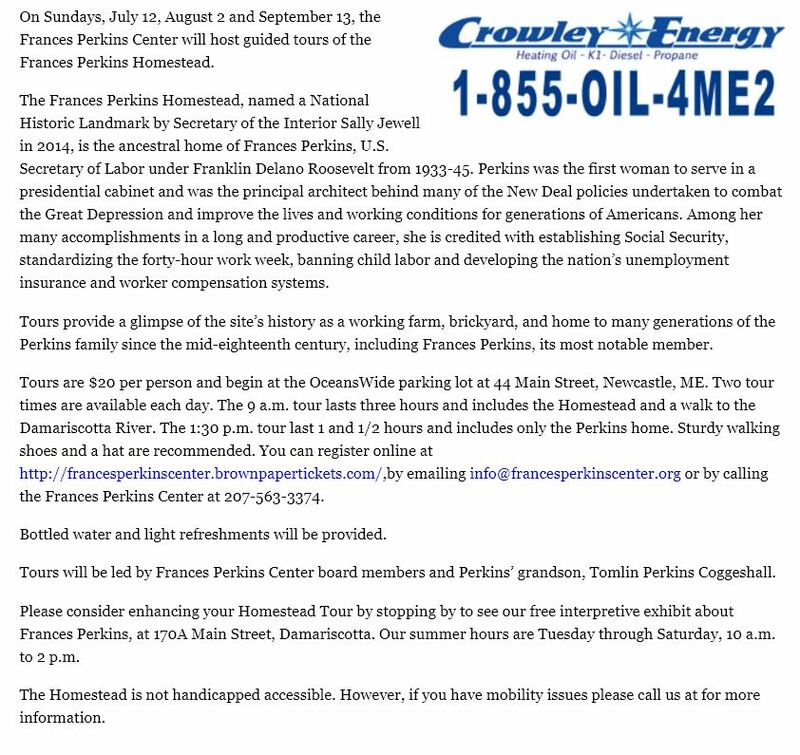 Please consider enhancing your Homestead Tour by stopping by to see our free interpretive exhibit about Frances Perkins, at 170A Main Street, Damariscotta. Our summer hours are Tuesday through Saturday, 10 a.m. to 2 p.m. The Homestead is not handicapped accessible. However, if you have mobility issues please call us at for more information.